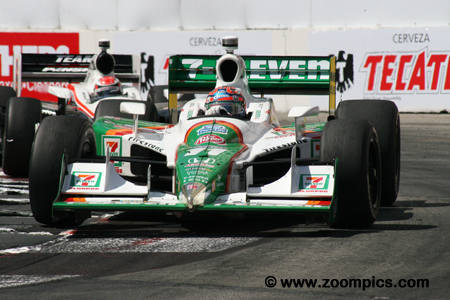 2010 marked the fifteenth season for the IndyCar Series. Seventeen rounds would be contested to determine titles for teams, engine manufacturers and drivers. The season opened in mid-March at Sao Paulo, Brazil and ended at Homestead-Miami Speedway, Florida in early October. In between these two weekends, there were races held at Saint Petersburg, Barber Motorsports Park, Long Beach, Kansas Speedway, Indianapolis, Texas Motor Speedway, Iowa Speedway, Watkins Glen, Toronto, Edmonton, Mid-Ohio, Sonoma, Chicagoland Speedway, Kentucky Speedway and Twin Ring Motegi. There were some noteworthy stories for the 2010 season. Perhaps, the biggest was announced on November 5, 2009, when the public was informed that the clothing company Izod would be the series’ title sponsor. The multi-million dollar agreement was for six years (2010 – 2015). A.J. Foyt Oval Championship for the driver scoring the most points in the seven oval races. Mario Andretti Road Course Championship given to the competitor with highest points total on the nine street/road course events. Teams continued to use the Dallara IR-05 chassis but the Honda engine deal was supposed to end in 2009. However, the contract for Honda to be the series only engine supplier was extended to the 2011 season. The Honda HR7R-HR11R used by entrants is 3.5-liter aluminum alloy V8-engine. The fuel-injected normally-aspirated motor produces 650-horsepower at 10,300-rpm. Finally, early in the year Indy Racing League founder, Tony George resigned. Replacing George as the leader of the series was Randy Bernard. 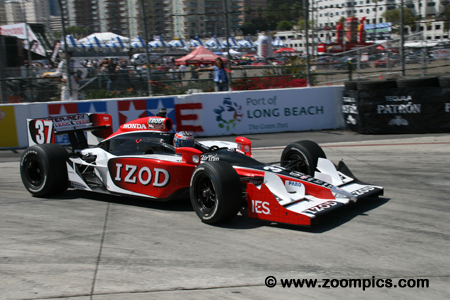 Round four of the 2010 Izod IndyCar championship was held during the Long Beach Grand Prix weekend. Competitors would race around the eleven-turn 1.968-mile street course for eighty-five laps. There was a total of twenty-five entries. Ryan Hunter-Reay was the second quickest in qualifying and was gridded on the front row with Will Power. 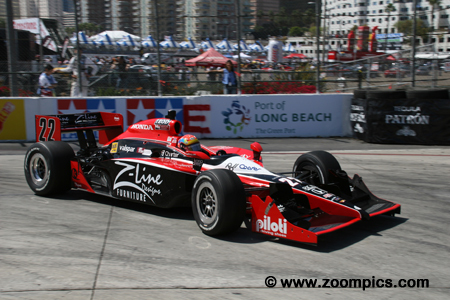 At the start, he was challenged by third place qualifier Justin Wilson but maintained his position. An error by Will Power allowed Hunter-Reay to take the lead. He maintained first place for the remainder of the race winning by a margin of 5.6-seconds – which was the second victory of his IndyCar career. 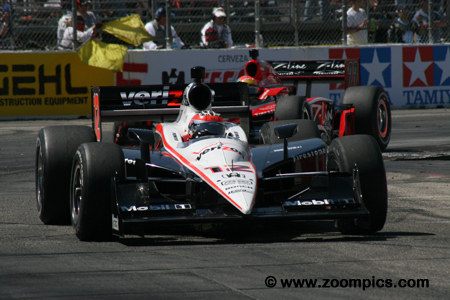 Quickest at the end of the ‘Firestone Fast Six’ was Will Power – this was Power’s third pole position in as many races. He led the field into the first turn but on lap-17 he accidently hit the speed limiter and was passed by Ryan Hunter-Reay and Justin Wilson. Power was unable to overcome this error and finished third. 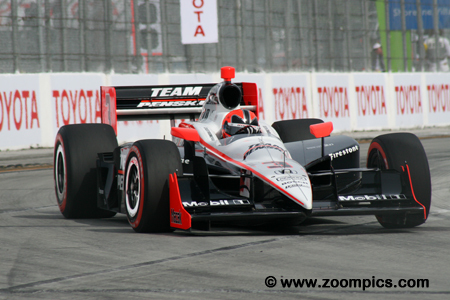 He left Long Beach with the points lead intact – 172-points to second place, Helio Castroneves’ tally of 130. Justin Wilson drove the No. 22 Dallara and started third. At the start, Wilson challenged second fastest qualifier, Ryan Hunter-Reay, into turn one but was unable to complete the pass and held the third position. He moved into second when Will Power had an issue. Despite an incident, which damaged the front wing, while lapping Alex Lloyd, he was able to maintain second place and finished in the runner-up spot. Helio Castroneves entered Long Beach second in the point standings. Castroneves qualified fourth but at the start was passed by a hard-charging Tony Kanaan. During the contest, he also lost positions to Scott Dixon and Mario Moraes. At the checkered flag, Castroneves was seventh. He was still second in the driver standings after Long Beach but Castroneves was only one-point ahead of Ryan Hunter-Reay. 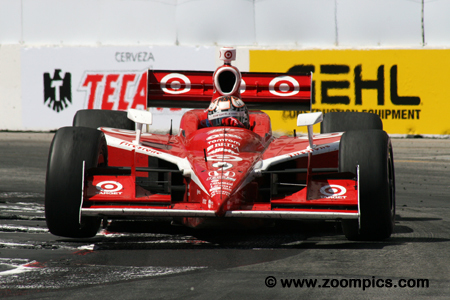 Scott Dixon started from the eighth position on the grid in a Dallara entered by Chip Ganassi Racing. 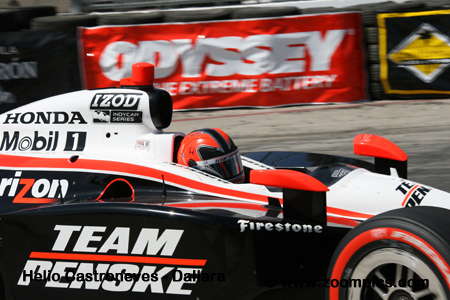 Early in the contest, Dixon pressured Penske drivers – Ryan Briscoe and Helio Castroneves. During the first round of pit-stops, he moved past Castroneves and made steady progress during the race. At the end of eighty-five laps, Dixon was in fourth place. 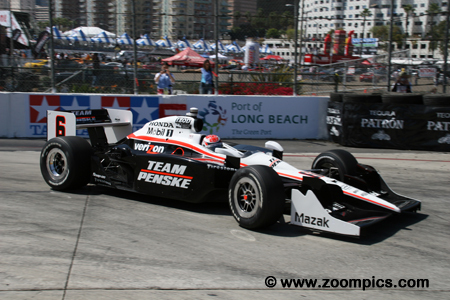 Team Penske driver, Ryan Briscoe qualified in sixth place - behind his two teammates, Will Power and Helio Castroneves. At the start, Briscoe lost a position to Tony Kanaan but on lap-18 he was back in sixth place after he passed Castroneves. A slow pit-stop just past the mid-point of the event dropped him to eighth. Unable to overcome this deficit, Briscoe would finish in eighth place. Qualifying sixth was 2004 IndyCar Series champion, Tony Kanaan. Kanaan made an excellent start and passed Penske drivers – Helio Castroneves and Ryan Briscoe. He trailed the leaders, Ryan Hunter-Reay, Justin Wilson and Will Power but Kanaan could not match their pace and slowly fell back. Before the end of the contest, he was passed for fourth place by Scott Dixon and finished on the lead lap in fifth. Surprising the regulars at Long Beach was Mario Moraes. Moraes made his IndyCar Series debut in 2008 with Dale Coyne Racing. In 2009 he joined KV Racing Technology scoring his best results to date – a third a Chicagoland. 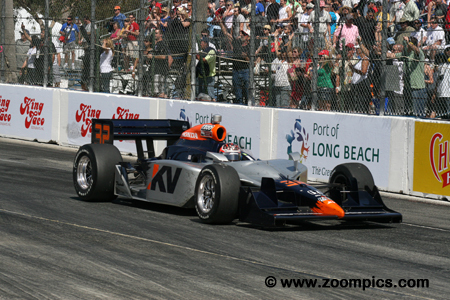 At Long Beach, Moraes was fifteenth on the starting grid. He made steady progress during the event and sixth at the checkered flag. 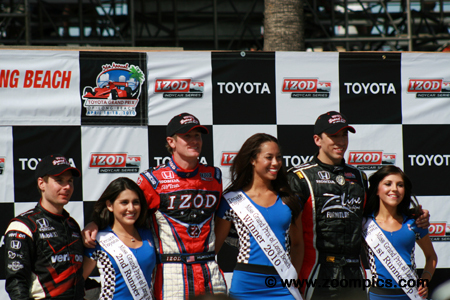 The Toyota Grand Prix of Long Beach IndyCar podium. On the left is point’s leader and third place finisher Will Power. Runner-up, Justin Wilson of Dale Coyne Racing is on the right. In the center is Andretti Autosport’s Ryan Hunter-Reay who scored his second career IndyCar victory.